CLICK HERE TO WATCH THE VIDEO OF HOW TO MAKE CANDY SUSHI! 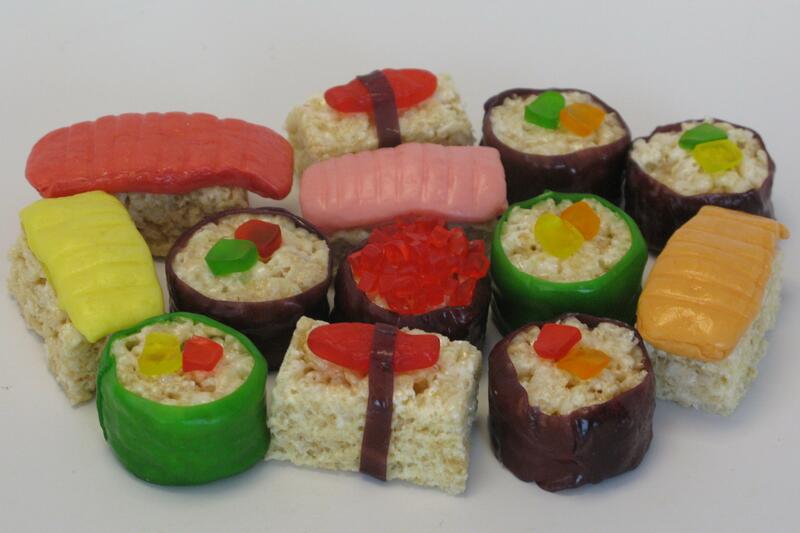 Candy Sushi…who knew? Really! A good friend that I grew up with had a birthday dinner party last night at a sushi restaurant, and she had asked me a while back if I could make the cake. When I talked to her earlier in the week, I had an idea of what I was going to do, but hadn’t nailed down anything in particular…until I started doing some research. When I did a search for sushi cake, so many options came up…but what caught my eye was all of the sushi-looking desserts. What? How is this possible? I continued looking through, and saw that this candy sushi was made out of rice krispie treats, fruit roll ups, starbursts, gummy worms, and Swedish fish. Holy cow, this was the jackpot! When I originally tried to make the sushi the way a couple of videos had instructed, it fell apart. Literally. I placed the gummy worms on top of the rice krispie treats in a pan, attempted to roll them up like real sushi…and FLOP. Bigtime. As I stared at the mess and kept thinking about what in the world was my backup plan going to be, I ended up having to walk away. Got too frustrated, and didn’t have the ingredients to make another batch of rice krispie treats. As I’m cooking dinner and brainstorming, it hit me that there was a box of store bought rice krispie treats in pantry. Then, the creative juices REALLY started flowing. Success! And honestly, making them this way was SO much easier than the original way. Well, to me at least…and time isn’t an issue. You can make as few or as many as you want, and don’t have to worry about the rice krispie treats settling and not being able to work with them. Also, if you still want to make the treats from scratch, just press them into a pan, let them set, then cut them into the shapes you need. I used a small round cutter for the rolls, and just cut rectangles for the rest. I used purple and green fruit roll ups as the seaweed, cut little slices of colored gummy worms and put them on top. The other ones are starbursts, shaped into fish and placed on top of the treats, and the lines are created with the flat edge of a knife. 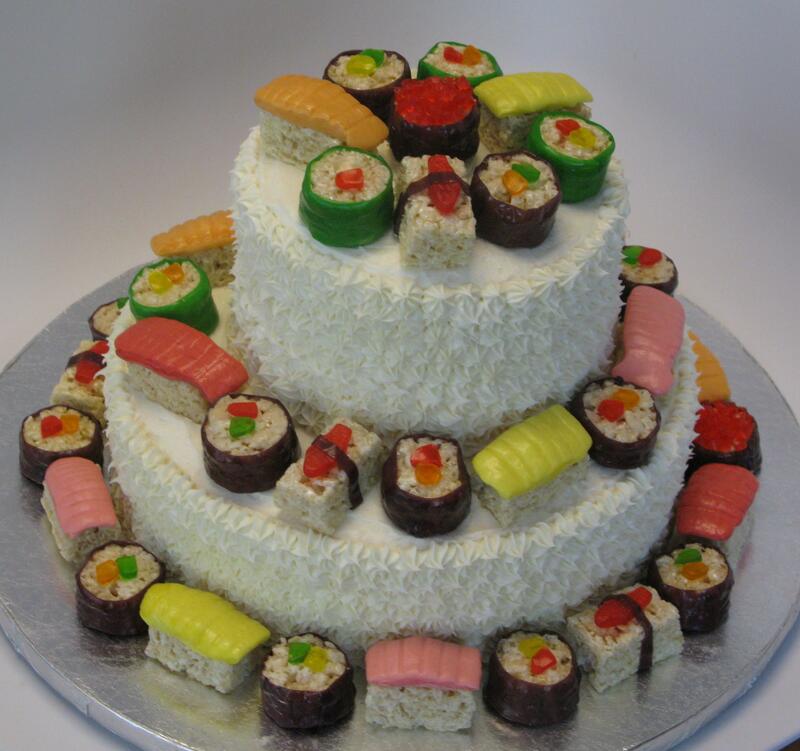 And here we are, with the sushi cake! And let me tell you…walking in to a crowded sushi restaurant with this cake was fun. Inakaya is THE place to get sushi in town. I overheard several of the, “Oh wow,” and “That’s so awesome!” comments as I walked by. It’s a two tiered chocolate strawberry swirl cake covered with cream cheese icing, and of course topped with all of the sushi. I needed an extra cup of coffee this morning, because I stayed out later than my bedtime. This was an awesome and fun group of girls who made a lot of noise…and I loved every second of it. My husband was picking on me when I got home, raving about how much fun we had, and he asked if I made some new friends. I flashed a big, cheesy smile and said, “I sure did!” This cake was a huge hit, and the fact that the sushi is edible makes it even better! This may be my favorite of your pastry inventions, yet!! How cool are these little sushi rolls??!!? I LOVE THEM and I’m so glad you’re in the kitchen challenging the boundaries of edible delights. Your creations make the celebration! I can see you now, walking into Inakaya with this– I bet you made everyone’s night.